Identity management vendor Okta and Google have announced a partnership aimed at getting enterprises to secure their users' identities in the cloud. As part of the deal, Google will use Okta as its preferred identity provider for Google Apps enterprise customers. Businesses that buy a ton of Apps for Work licenses will also be encouraged to use Okta's services to manage how their users connect to business apps. Okta's identity management product makes it possible for companies to create one central directory of employees, who can then use a single set of credentials to get into business software that they need to use. That includes Google Apps and a variety of other services like Salesforce, Yammer, and ServiceNow. In the deal, Google gets a cloud-native identity-as-a-service provider that it can use to entice enterprises to adopt its productivity suite and cloud platform. Okta gets access to massive customers that are looking to modernize their technology stack. That's especially important for Okta as it goes up against a slew of competitors, including Microsoft, OneLogin, and others. Google already offers identity management through Apps for Work, but that system isn't suited to apps that don't integrate with Google products. 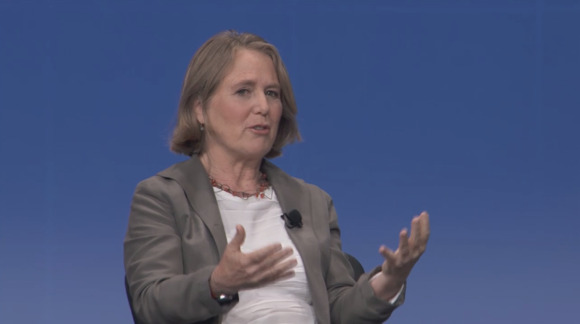 The partnership was driven by Diane Greene, executive vice president of Google Cloud Enterprise and former VMware CEO, said Eric Berg, Okta's chief product officer. "One of the things that was very important to her, as she grew [VMware], was that it didn't end up in the hands of one of the server vendors," he said in an interview. "Because the value of virtualization being a neutral layer was much greater -- the value to the customers, the value to the company, the value of the company, etc. And she gets that when it comes to identity, that it's a very similar type of functionality in the stack." So rather than taking a vendor-specific approach to workplace identity, Google is partnering with Okta. Meanwhile, Okta will continue integrating its products with a variety of other companies' offerings, including those from Microsoft, Amazon, and others in direct competition with Google. The deal is a not-so-subtle snub of Microsoft, which is locked in tight competition with Google for productivity software and cloud service customers. It's also competing with Okta through its Enterprise Mobility Suite and Azure Active Directory products. There's no love lost between Microsoft and Okta, after the tech titan temporarily barred the identity management company from taking part in its upcoming Ignite conference. Okta has since been re-invited. The move is a formalization of an existing relationship, Berg said. The two companies already share some large customers, but this partnership will codify the fact that the two businesses will go to market together. The deal is part of a set of announcements at Okta's big Oktane conference, in Las Vegas this week. The company also announced a new API access management product and changes to its provisioning product to support the management of employees' access to technology throughout their entire time at a company.